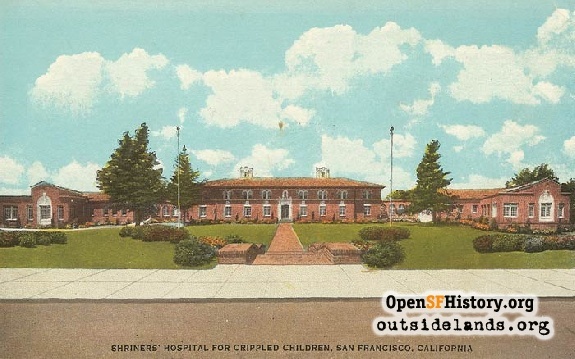 A quiz on the lesser known byways of western San Francisco. So, you think you know the streets in the Western Neighborhoods pretty well, huh? Do you really think that all Richmond and Sunset District streets are in alphabetical and numerical order? 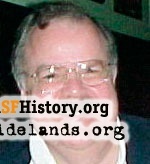 Today, we have a Streets of the Outside Lands Quiz. See if you can identify the location of the following streets by naming the nearest major intersection, or even the general area. The territory covered here is from the Golden Gate Bridge south to Sloat Boulevard and from Arguello Boulevard to Ocean Beach. Most of these locations are duly marked with street signs, but I’ve indicated a couple that are not, though these are clearly noted on Google Earth maps. Most are fully paved, with a couple of exceptions noted in the answers. Just to make things easier for all of us, I’ve excluded all those tiny roads that lace the Presidio and Golden Gate Park, along with all of the meandering streets in the West Portal, St. Francis Wood, Mount Davidson, Twin Peaks, and Forest Hill neighborhoods. Likewise, I’ve excluded a couple of unnamed easements (one near 35th Avenue and Sloat Boulevard, plus a couple of more in the Richmond District), as well as a driveway adjacent to the 37th Avenue campus of St. Ignatius that has a street sign reading simply "Go Cats!" Aerial Way, Aloha Avenue, Avon Way, Ardenwood Way, Anglo Alley, Alta Mar Way, Briarcliff Terrace, Cecilia Avenue, Constanso Way, Cornwall Street, Cragmont Avenue, Crestlake Drive, Cutler Avenue, El Mirasol Place, Escondido Avenue, Escolta Way, Fanning Way, Gabilan Way, Goleta Avenue, Hugo Street, Judah Alley, Koret Way, LaPlaya Street, Locksley Avenue, Lomita Avenue, Lurline Street, Mandalay Lane, Marvel Court, McLaren Avenue, Oriole Way, Palos Place, Paraiso Place, Point Lobos Avenue, Presidio Terrace, Radio Terrace, Rockridge Drive, Rosemary Court, Scenic Way, Sea Cliff Avenue, Seal Rock Drive, Sea View Terrace, Sheldon Terrace, Shore View Avenue, Shriners Avenue, Stern Grove Court, Sutro Heights Avenue, Vale Avenue, Veterans Boulevard, West Clay Street, Yorba Street, and last, but not least, 20½ Avenue. Aerial Way—Small street in Golden Gate Heights that runs east-west from 14th Avenue to Ortega Street, but is open to vehicle traffic only one block from Funston Avenue to Pacheco Street. Aloha Avenue—Curving street in Golden Gate Heights that runs from Funston Avenue, between Lawton and Moraga streets, to Lomita Avenue. Avon Way—Small cul-de-sac just north of Sloat Boulevard, and east of 19th Avenue. Ardenwood Way—Small cul-de-sac just north of Sloat Boulevard, east of 19th Avenue, and just south of Junipero Serra Boulevard. 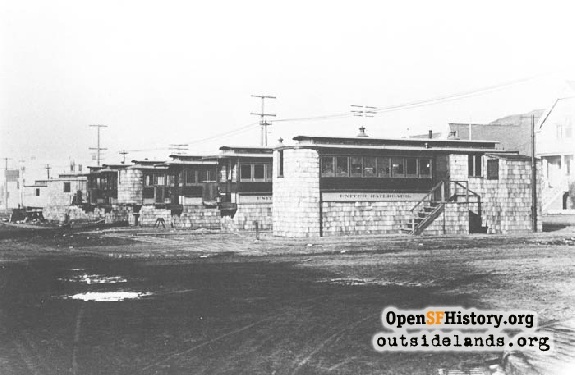 Anglo Alley—Runs north-south for about 1½ blocks, from Ortega Street to just south of Pacheco Street, between 17th and 18th Avenues. Alta Mar Way—Just as the name implies, “high above the sea,” this tiny north-south street of tidy 1940s homes begins at Seal Rock Drive and ends at Point Lobos Avenue between 46th and 47th avenues. Briarcliff Terrace—A gated, private street beginning at 19th Avenue, between Wawona Street and Sloat Boulevard, then running easterly onto the grounds of the Christian Science Benevolent Association’s care facility. Cecilia Avenue—Runs for nearly two full blocks, north-south from Rivera Street to a spot just north of Taraval Street, between 15th and 16th avenues. Named in honor of St. Cecilia’s Parish, whose original church was erected nearby in 1917. Constanso Way—Small north-south street, running from Crestlake Drive to Sloat Boulevard in the area south of Stern Grove. Cornwall Street—Runs east-west from Arguello Boulevard to Seventh Avenue, off California Street. The area near Sixth Avenue was once known as Carzonia where old cable cars had been converted to homes—not to be confused with Carville farther out near the beach. Cragmont Avenue—L-shaped street in Golden Gate Heights, from Quintara Street to 12th Avenue, in the spot that would ordinarily have been occupied by 11th Avenue. Crestlake Drive—Meandering east-west street located between Sigmund Stern Grove on the north and Sloat Boulevard on the south, and extending from 23rd Avenue and Sloat Boulevard to 34th Avenue and Wawona Street. Cutler Avenue—One block long, running east-west from 47th Avenue to Great Highway, between Vicente and Wawona streets. El Mirasol Place—Small north-south street running from Crestlake Drive to Sloat Boulevard in the area south of Stern Grove. Escondido Avenue—Runs east-west from Constanso Way to 34th Avenue, just north of Sloat Boulevard. Escolta Way—Runs east-west from 30th Avenue to 33rd Avenue, between Vicente and Wawona streets. Fanning Way—Small street in Golden Gate Heights that runs from the corner of 15th Avenue and Quintara Street to 14th Avenue, between Pacheco and Quintara streets. Gabilan Way—Small north-south street running from Crestlake Drive to Sloat Boulevard in the area south of Stern Grove. Goleta Avenue—Small north-south street running from Crestlake Drive to Sloat Boulevard in the area south of Stern Grove. Hugo Street—Runs east-west from Arguello Boulevard to Seventh Avenue, between Lincoln Way and Irving Street. Judah Alley—Partially paved dirt alley that runs north-south from Judah to Kirkham streets, between 23rd and 24th avenues. No signs posted, but each end of the alley is marked by concrete pillars about four feet in height. Google Earth also refers to this location as “Dirt Alley” and “23rd ½ Avenue”. Koret Way—A long, dog-legged, fully-paved cul-de-sac extending from Fourth Avenue and Kirkham Street through the area behind some of the buildings of UC Medical Center. La Playa —Runs north-south from Lincoln Way to a point just south of Kirkham where it merges into the lower portion of Great Highway. Spanish for “the beach,” it was a colorful substitute for the “49th Avenue” shown on some early maps. Locksley Avenue—Small, curving street, linking Lawton Street, just east of Seventh Avenue to Sixth Avenue, just south of Kirkham Street—created in the early 1960s when the twin “Sunset Towers” were constructed. Lomita Avenue—Curving street in Golden Gate Heights that runs from about 16th Avenue and Moraga Street to 15th Avenue and Lawton Street. Lurline Street—One block long, curving from 14th Avenue and Kirkham Street to Funston Avenue, between Kirkham and Lawton streets. Mandalay Lane—Pedestrian stairway from 15th Avenue and Pacheco Street to 14th Avenue and Radio Terrace. Marvel Court—Tiny east-west cul-de-sac of 1950s homes, just off the 300 block of 32nd Avenue, between California and Clement. The street dead-ends into a retaining wall at the grounds of the Palace of the Legion of Honor. McLaren Avenue—Small east-west street in Sea Cliff, running from the 100 block of 28th Avenue to El Camino del Mar. Oriole Way—Small pedestrian-only lane and stairs running between Cragmont Avenue and Pacheco Street. Palos Place—Small north-south street running from Crestlake Drive to Sloat Boulevard in the area south of Stern Grove. Paraiso Place—Small north-south street running from Crestlake Drive to Sloat Boulevard in the area south of Stern Grove. Point Lobos Avenue—At 42nd Avenue, Geary Boulevard splits off to the left, and Point Lobos Avenue begins, then running west past the Cliff House to meet with Great Highway. 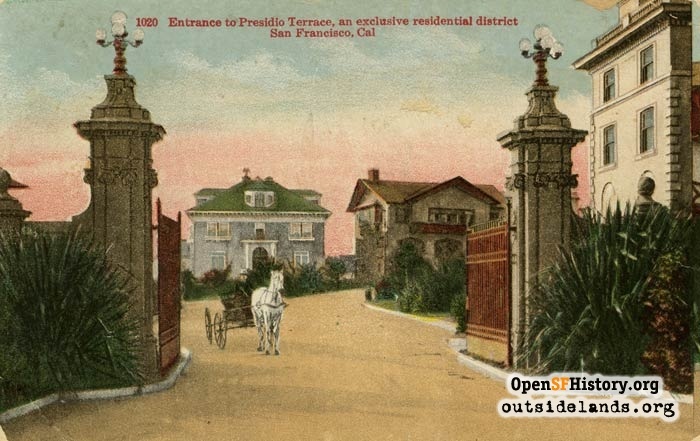 Postcard image of entry gate to Presidio Terrace, 1910s., circa 1915 - Courtesy of Dennis O'Rorke. Presidio Terrace—Exclusive circular cul-de-sac just off Arguello Boulevard and south of the Presidio, it is literally in the shadows of its red-tile-roofed neighbor, Temple Emanu-El at Arguello Boulevard and Lake Street. Radio Terrace—Small street in Golden Gate Heights that runs from 14th Avenue to Rockridge Drive. Rockridge Drive—Runs east-west in Golden Gate Heights from 12th Avenue to 14th Avenue. Rosemary Court—Small cul-de-sac in the Parkside District, extending east off the 2600 block of 25th Avenue, south of Vicente Street. Scenic Way—Small east-west street in Sea Cliff, running between the first blocks of 25th Avenue and 26th Avenue. Sea Cliff Avenue—The northernmost east-west residential street in Sea Cliff, extending some five blocks from the first block of 25th Avenue until its dead end just above China Beach. Seal Rock Drive—East-west residential street that begins where Clement Street ends at 45th Avenue, and then continues to El Camino del Mar above the Cliff House. Sea View Terrace—East-west residential street that begins in the 200 block of 30th Avenue, between Lake and California streets, and runs for 1½ blocks. Sheldon Terrace—Golden Gate Heights cul-de-sac, off 15th Avenue near Noriega Street. Shore View Avenue—East-west residential street running from 36th Avenue to 38th Avenue, between Clement Street and Geary Boulevard. Shriners Avenue—Small north-south street, located in between recently-built townhouses facing 19th and 20th avenues. The street begins just south of Lawton Street and extends to just south of Moraga Street, with a street sign marking the corner of Shriners and Moraga. 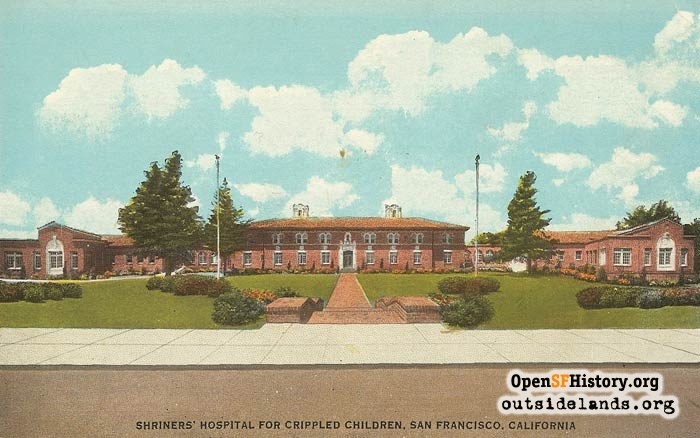 A small nod to the long-time Shriners Hospital for Children once located at the site. Sutro Heights Avenue—East-west street running from 46th Avenue to 48th Avenue, between Anza and Balboa streets. Vale Avenue—Small north-south street running from Crestlake Drive to Sloat Boulevard in the area south of Stern Grove. Veterans Boulevard—Beginning just north of Lake Street, between Funston Avenue and 14th Avenue (outside the Presidio boundaries), this is the approach to the Golden Gate Bridge, via the Douglas MacArthur Tunnel. Previously an unnamed street (other than its California Highway 1 designation), it became Veterans Boulevard in May of 1999, with a dedication ceremony held on Memorial Day of that year. West Clay Street—Runs east-west from 22nd Avenue to just west of 24th Avenue, north of Lake Street in Sea Cliff. Yorba Street—Last of the “Spanish name” alphabetical streets in the Sunset District, runs east-west from Crestlake Drive to just west of 40th Avenue, with a small pedestrian-only path known as Yorba Lane then extending to 41st Avenue and Sloat Boulevard. 20½ Avenue—Although I never noticed it before, there it is—a paved alley one block long, from Kirkham to Lawton streets, between 20th and 21st avenues—no signs. Page launched 25 May 2012.